Can you believe that summer is almost over?!!! One can’t help but notice stores already starting to put out fall decor and accents on their shelves, so I was curious to find out exactly when fall starts officially. Turns out that will start precisely on September 22nd, which means less than one month from now. I got excited because fall is my favorite season. But at the same time, I know that I will miss many summer treats such as our tropical Coconut-Banana Pudding, and the refreshing Chai Vanilla Milkshake, Quinoa Pilaf Salad Cups, and most of all our Frozen S’mores Cups. 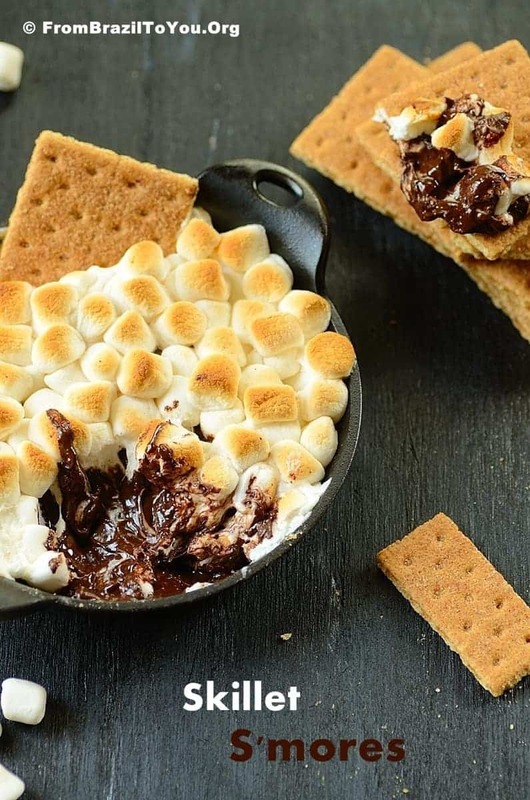 I am just crazy for S’mores, so I got the idea of making this ridiculously easy, three-ingredient Indoors Skillet S’mores… Just the sound of those words gets me all ecstatic, how about you?! I’ve always associated S’mores with campfires, and so with summertime… But making this comforting, warm S’mores treat made me realize that it also goes well with both fall and winter, too… Such a versatile, scrumptious treat, don’t you think? If you’ll please excuse me! 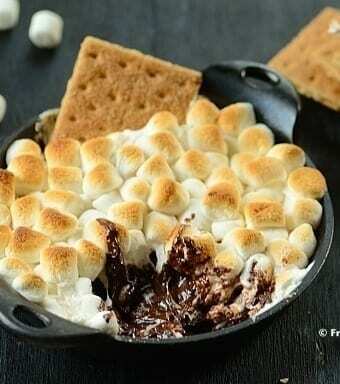 I am getting super anxious to dive into that scrumptious S’mores skillet… Have a great holiday weekend! Ooey gooey, warm Indoors S'mores to be enjoyed all year round!!! In a 10-inch cast iron skillet, add the chocolate (semisweet or dark according to your preference) in an even layer. Sprinkle marshmallows on top of the chopped chocolate. Bake until marshmallows are browned and chocolate is melted, about 4-5 minutes, as follows: The first 2-3 minutes, loosely cover skillet with a sheet of aluminum foil (tented so that it will not stick to the marshmallows)... Then, remove aluminum foil for the last 2 minutes so that marshmallows can brown. Let stand for approximately 4 minutes before serving with the crackers on the side. Enjoy! If you are serving this Skillet S'mores for one to a couple of people, you can decrease the ingredient amounts by half like I did, and use a smaller skillet. Recipe adapted from Taste of the South Magazine -- Sept./Oct. 2013 edition. 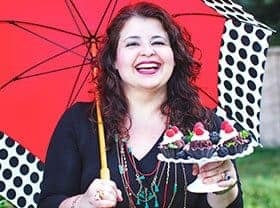 Bring your favorite chocolate dessert to Roxana’s home baking #chocolateparty and win amazing prizes from OXO, Calphalon, Keurig, Imperial Sugar, Honey Ridge Farmsand Land O Lakes® Butter. Oh my! This. Is. Incredbile! My keyboard is soaked – with drool! Thanks so much for always stopping by, Shashi! Wishing you an awesome weekend!!!! YUMMY!! That skillet looks amazing! Have a wonderful weekend Denise! What an awesome recipe…I wouldn’t mind dunking into it..:)..
Oh, can’t believe school’s started and routine’s crazy..anyways hope you are doing good and your little one’s OK. Have a great weekend. Thanks, Ash! Yes, she is well. Amen! Have a great weekend. How easy and marvelous! S’mores without camping out sounds just perfect! This is brilliant Denise! What a fabulous idea. We wanted s’mores last week but all the wood was wet and we couldn’t build a campfire. I wish I had had your wonderful recipe, it would have saved the day! Pinned! Thanks, Chris! I am so sorry that it came too late…But next time that y’all want to eat S’mores, you can use this recipe. Have a great holiday weekend!!! Wow, what a delightful treat to celebrate the upcoming season. Oh, how decadent! And an all American treat for the holiday weekend!!! YUM! Skillet s’mores? Love it! I just want to dive right in to the gooey chocolate! Thanks for stopping by, Christin! Thanks for sharing it, Sonali! Oh this looks super yummy. I love s’mores. No need for a fire here. 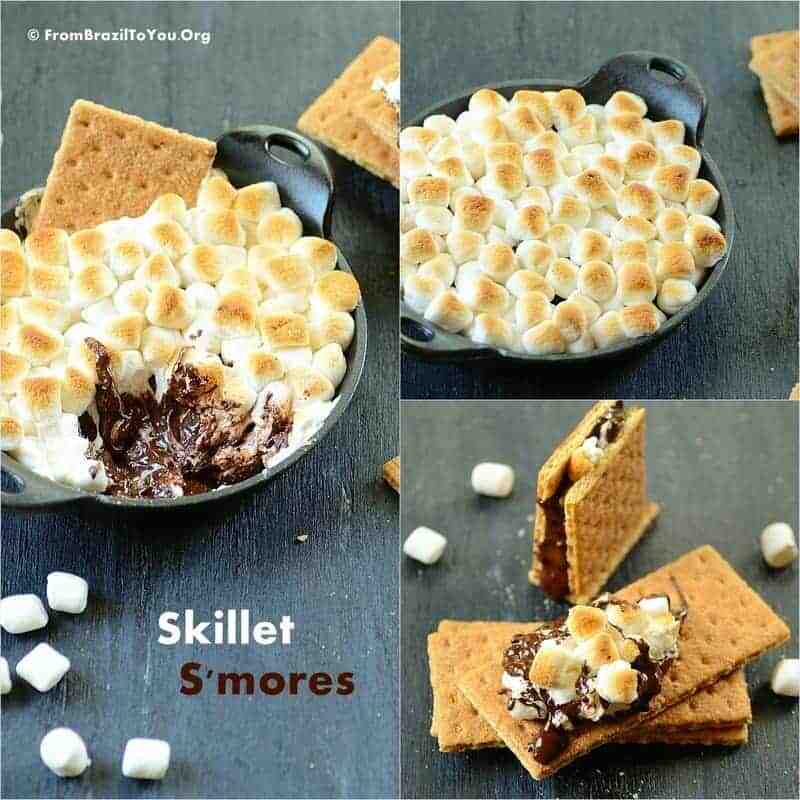 Denise, a skillet s’mores sounds so good and delicious! Thanks, Nik! We did enjoy it a lot. This is just too amazing. That melty chocolate… oh my word. I understand, Kammie! Since I am crazy over S’mores, I do avoid eating it often. I am afraid of my scale. Hehe. Oh wow, this looks incredible! I love s’mores. Thanks for visiting FBTY, Jennifer! I know that my daughters are just going to love this recipe. Thanks for sharing. Thanks, Felice! My seven-year-old is crazy for it. I hope y’all enjoy it!! Brilliant idea. My kids will love this. Thanks! Hi, Jennifer! A cast-iron skillet is necessary for this recipe because its excellent heat retention (distributed evenly) and non-stick surface. This way, the chocolate will melt evenly (you don’t want one side melted and the other semi-melted) and also won’t stick to the bottom of the skillet and get burned. The only cookware that I know that could be a suitable substitute is a non-stick stainless steel skillet with thick bottom (1/2 inch thick). Cast iron skillet is sold in different sizes. I like to make this recipe for my family of four in a small (about 6 inches) cast iron skillet. It’s cheaper and less heavy than the standard-size skillet. I hope this helps!!!! Have a great day! It is a pleasure to share these recipes with y’all. Thank you for stopping by! jennifer…so you do not need to grease the cast iron pan at all with any spray? Thanks, Kiran! The good thing about it is s’mores can be made indoors and enjoyed all year round. What a delicious idea! You don’t always have to have a camp fire to enjoy s’mores! Thank you! I do agree with you… I love S’mores so much that I eat it the entire year. What size cast iron skillets did you use, how did you divide the receipe, and what was the cook time? I used a 6-inch cast iron. For that size, I decreased the ingredient amounts by half of that stated in the recipe. The cooking time is the same stated in the recipe. Looks great in theory. Execution, not so much. Followed directions exactly. Marshmallows burned on top but not gooey. Chocolate only semi-melted. Think it needs a cooler oven and longer bake time. Just my two cents. I am so sorry yours did not turn out well. I posted the recipe here because I tested it first and mine came out perfect every time — as well as many others who have made it. Ovens vary. This is a fact! Unfortunately I have no way to control the precision of every single oven’s temperature. Since your oven possibly runs hotter than the average, try baking at a lower temp for a longer time, as you said. The recipe itself is not the problem… I am thinking it may be your oven. I am sorry but it is the truth. Have a great day!